"I’m based in Ashburn as well and wanted to support local entrepreneurs. 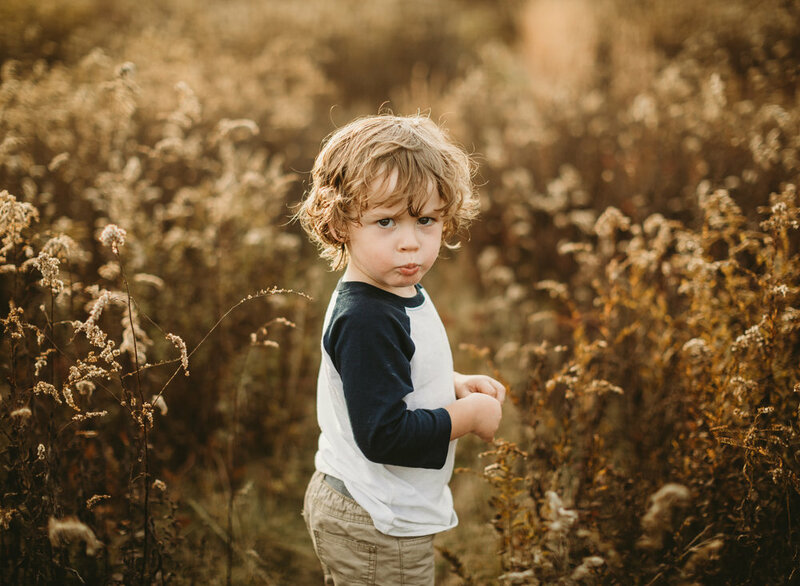 I’m searching for a family photographer to capture my son as he’s turning one and I love the pureness and joy expressed by the kids you’ve photographed and posted. I am a fan of kids being kids in their own element and surroundings and not so much staged studio photos, so I’m definitely a fan of your work!" I had to. Mama Ang and I both love a good pun. I was beyond thrilled when Angela asked me to take her family photos, like over the moon. And it was so awesome that they made the trip from Fairfax County to Loudoun to shoot in Morven Park, one of my favorite spots. Moreover, please take note of the outfits, coordinating but not matching. Ang straight up OWNED it. Parker (3) was a little unsure about me and the scenario in the beginning, so we went with the tried and true "pay-attention-to-the-other-child" method for a few minutes. Not long after that we were getting great smiles out of Parker, and he was loving it. Meanwhile little Carter (6 months) is just about the happiest little dude I've ever met, and smiled away. Since I'm feeling Christmasy, he reminds me of Elf and the quote "I love smiling, smiling's my favorite!" It was hard to narrow down my favorites, so here are just a few! I was a freakishly cold day in November when I met with the Orr family for their Christmas card photo session. Allie (5) and Finn (2) both fell asleep en route to the location, and I know my kids can be somewhat difficult when awoken from a nap, but these two were ready to go! Admittedly, it got a little too cold for Finn, but even subzero temperatures couldn't stop Allie from hamming it up! Just the sweetest, coziest little girl ever! She couldn't be any more stunning! We're the two best friends that anyone could have! This kills me, Finn is like "lady, I've had more than enough, and if you don't stop taking pictures I'm going to stab you with this candy cane!" Cora has been a fighter from day one, and she continued to fight through our one year session! 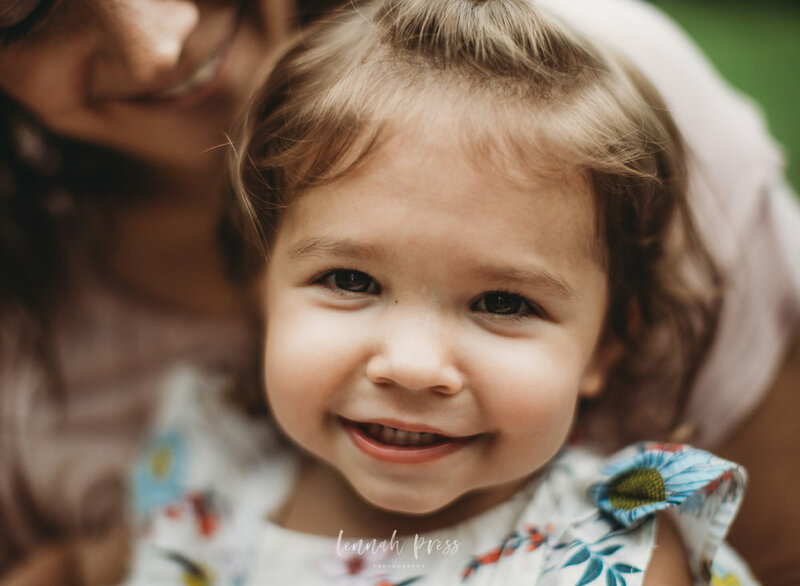 She's come such a long way from her newborn session, and with her mama being one of my closest friends, it was so meaningful to be able to document this milestone as well. Enjoy this fiery strawberry blonde/redheads pics! My kids are 3 and 1, they are my inspiration. I had been "in" to photography since my sophomore year of high school, but have gone through periods where I didn't pick my camera up for weeks and sometimes even months at a time. 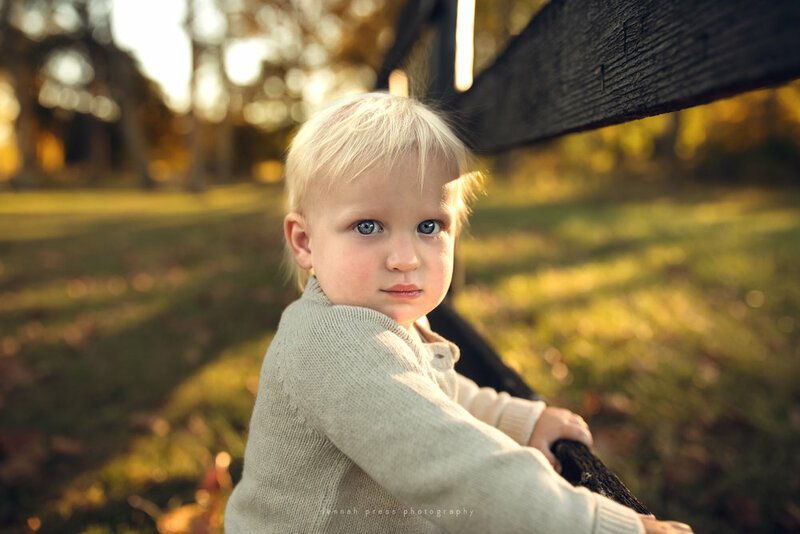 When I had my son three years ago, my passion for photography was reignited, and has grown stronger with every day. These years, when my little ones are little, seem to fly by, and I can't resist the urge to document...but once in a while I have to be reminded to put my camera down again and live. My husband and I have always loved the outdoors and it's played a large supporting role in our journey together. Some of my favorite memories of ours took place in Virginia's regional and national parks, so I'm thrilled that our children already share in their parents' love for nature. An unexpected result of our family nature walks is that we've come upon new photo spots, and I've gotten to know how the light acts in these different locations throughout the year. Jacob is only 3, but he is already on to me when I dress him and his sister up and take them to a new park. 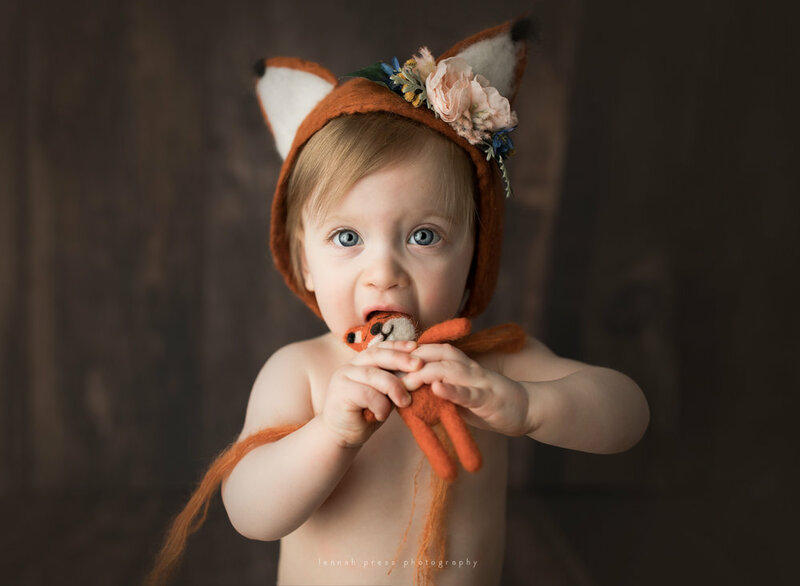 Have you ever heard of photographer child syndrome? It's when a photographer's children are so used to being photographed throughout their young life that they are no longer interested in smiling at the camera, much less looking at it. But as a photographer who revels in capturing emotion, personality and connections, a lot of times this isn't a bad thing. Because so far, these tend to be some of my favorite images of my children. I just love this. On one hand, their expressions are hilarious and make me laugh. But it's also such a beautiful capture of my silly children just as they are in this moment in time. This is currently one of my favorite images of my son. Initially I posed him on the blanket in a way that I felt would work best. Never one to make my life easy, this guy started rolling around all over the place. Somehow I managed to capture this, and I love it. I recently discovered that I have a vintage quilt problem. In that I love them, and want them all. Simultaneously, my daughter has recently started playing a game at home that cracks all of us up. She brings a blanket to you, and motions that you are to wrap it around her. Then she holds it around herself and walks around the house like some kind of royalty. So for this image, we took our game outside! Where did she get those dimples? Definitely not me! I took the kiddos here to check out the light, play some soccer and get some nice images of them. Instead I get this...however, Captures like this absolutely crack me up. Fiona wants her chair back, Jacob looks pretty proud at having stolen it from her. Hiking through Big meadows in Shenandoah National Park during the most beautiful golden hour. "Hey bud, smile nice for the camera!" Jacob does this...but it's perfect. It's my wild guy. Maybe Gnats, maybe a facepalm. Again, if it makes me laugh, It's in. Dial back the moxie, sassmouth! As we were walking out to the car in the morning, the light was perfect. I ran upstairs, grabbed my camera and caught baby girl as she tasted a brief moment of freedom. 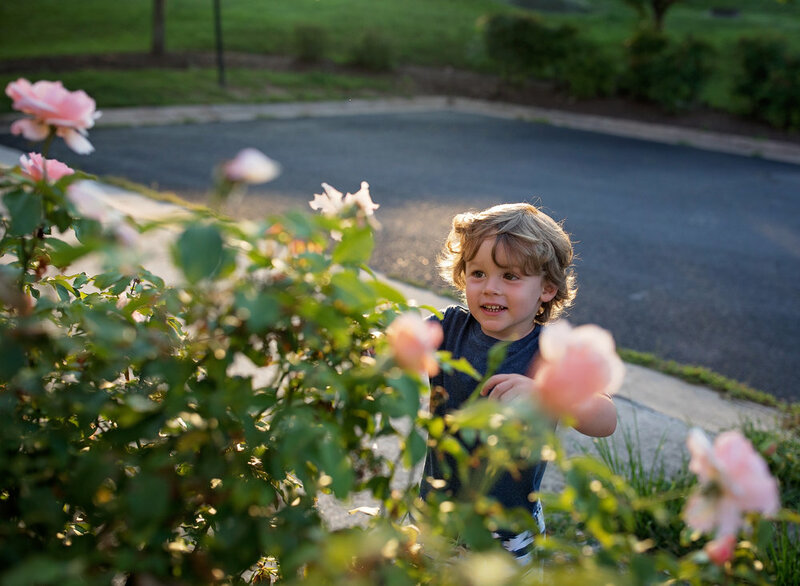 Then I moved a few feet and caught this beautiful moment of a toddler taking a moment to stop and smell the roses. Mid afternoon sun comes in bright white in the summer as my little gymnast balances. We took an afternoon hike at a nearby trail, as Jacob started messing with the dirt I realized that it softened the light and created a magical atmosphere. So i encouraged him to kick the dirt all over the place while I snapped away, and Fiona gave him the Heisman. We all got super dirty, but it was so worth it. A sunday evening hike backlit by the setting sun. And an angry baby who thinks she should be allowed to scale rocks on her own. We took images at a few different settings within one main park to add variety to their gallery, and every step of the way was so much fun. I think the pinnacle was when we moved to the final location which had these insane ball seed things all over the place. I literally just googled as "weird ball seed brain looking things from trees" and it turns out they are Osage Oranges from Osage trees. One year old Henry was the first to spot them, pointing and saying "ball!". So we let the boys play with them (don't worry, they're not toxic, in fact my google search just taught me that they're edible but it's very difficult to extract the seeds.) Then we realized that they kind of worked as a Christmas-y props, their green coloring contrasting against the red blanket that the boys sat upon. The boys loved them, and all in all, it was just hilarious. I just had such a blast hanging out with this fun family. And look at the eyes on these boys, talk about stunning! 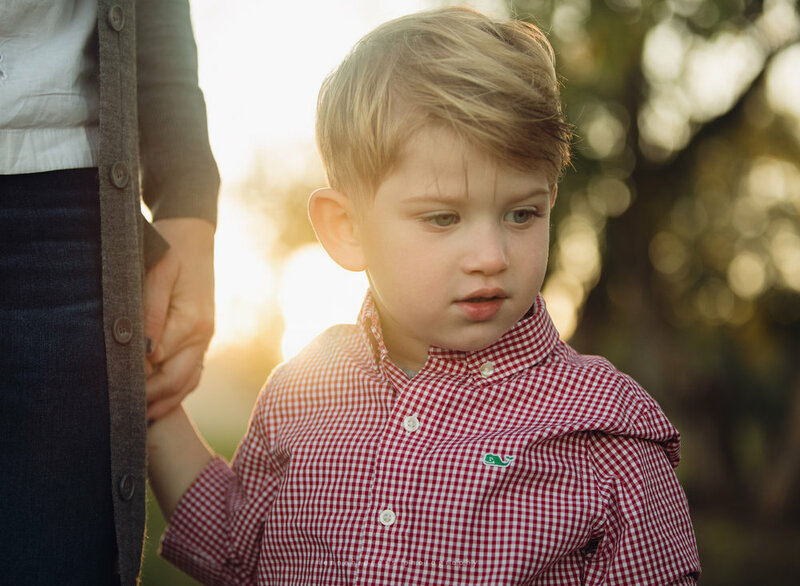 I've noticed that styling outfits for a family photo session is probably the biggest stressor for clients. And I'll fully admit, since having children, I feel like I've lost touch with what "the kids are wearing" and what's in. So while I'm no fashion guru, I do have an understanding of color theory and what photographs well. When you're having your fall family photographs taken, think about the colors in the outdoor setting around you. Hopefully we've set your session for peak color, so there should be oranges, reds and golden yellows around you. From there, you can check out the color wheel to the right and see that opposite to golden yellows are navy blues and purples. Your family would definitely pop against yellow leaves in those tones. Neutrals also work against almost any backdrop, and always look timeless. Neutrals can be anything from white, ivory, cream, tan, khaki, mocha, camel, brown, grey, black, denim, and sometimes even blush pinks or olive greens. I truly don't think there can be too many neutrals in a palette. Not sure where to start? Pick 2-3 main colors. There should be elements of these colors in everyone's outfits. From there, pick some neutrals. A lot of times, neutrals will be the blueish tone of denim, a khaki or brown, blacks and grays, or a toned down version of the main colors that you chose. Lastly, pick 1-2 pops of color. These accent colors tend to be bright and vibrant and oftentimes are the most visible element tying the photos together. When choosing a color scheme, consider the season, setting, and where you'll display the images in your home. Start with one piece. To get the ball rolling, start with one outfit that you really love, and build the other outfits around that. Matching is out, coordinating is in. Layer, layer layer! This adds dimension and depth to your images. Fit. Purchase clothes that fit now. I know, if I'm buying a fall sweater for my son from Janie and Jack, I want to get as much wear out of that ridiculously priced piece of clothing as possible. But I beg of you, buy your child's current size. Rolled up sleeves and pant legs end up looking sloppy and undone in your final images. Dress for the weather. Be prepared with a flexible wardrobe in case you have to switch it up at the last minute. If your child is burning up in a sweater, he won't be happy and we won't be able to get images that you will cherish forever. Footwear. Shoes are such an important part of the wardrobe. Imagine your daughter dressed to the nines for the family shoot, but with her light up paw patrol shoes on. It causes the entire look to lose cohesion. My recommendation for shoes are boots, leather sandals, Converse All-Stars, Toms, Sperrys, and Mary Janes. Also, weather and setting-permitting, barefoot is always an adorable option, especially with babies. Let Your Child's Personality Shine! 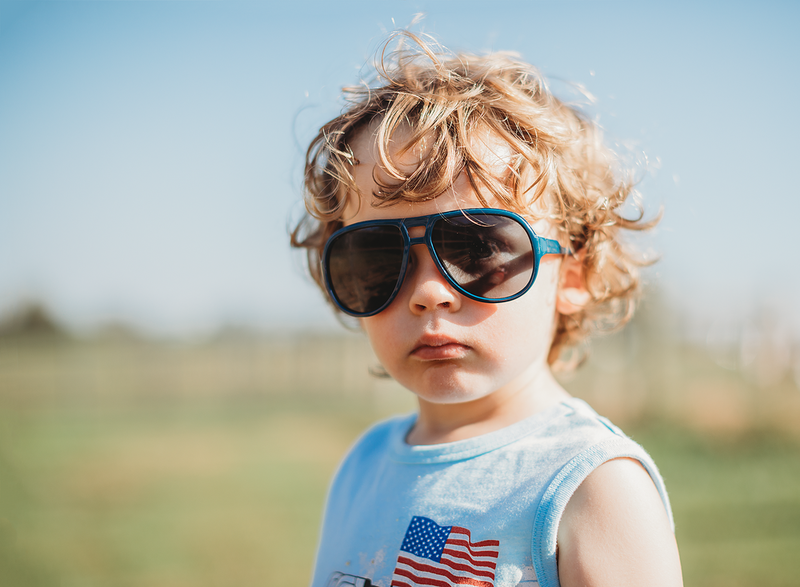 Allow your child's personality to shine through in what they’re wearing. If your daughter has a favorite pair of boots, let her wear them (at least in a few pictures). Whatever makes your child their own amazing self, let’s focus on those things. This family nailed it for their Christmas shoot with plenty of neutrals (cream, tan, browns and olive) with pops of a bright Christmas-y red. Check out this coordination, mom and dad wore olive green and dark navy, and let the kids pop with a beautifully textured velvet dress and the quintessential fall mustard yellow. Nailed it! 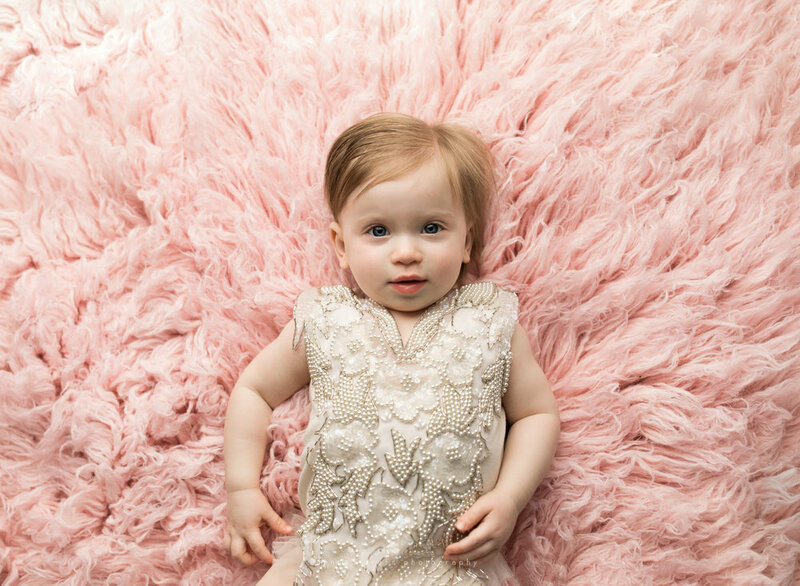 Mom did a great job pulling colors from this little one’s dress for everyone else’s outfits. You can’t go wrong with neutrals, this family is picture perfect for their holiday card! Right out of college I took a graphic design job at a small government contractor in Northern Virginia. The hours were grueling, the work wasn't fun, and it was quite the wake up call for me in terms of what I could expect in the real world. However, I will always look back on my time at that company fondly, as I met my husband there, and some of my best friends. One of those friends also met her husband there. Christina was the receptionist, the ever-friendly face of the company, and Mike was the quiet but hilarious (when he spoke up) accounting guy. I know that I rooted for them to start dating, and I think of the rest of the company felt the same. It took much longer than many of us meddlers would have liked, but eventually Mike and Christina went on their first date and the rest is history. Here we are over 10 years later, and they have started a family that I was honored to get the chance to photograph. It was such a joy to capture their love and connection, plus they were such great sports with the heat and unbelievable amount of gnats! You might be noticing a theme here...I met Julie through my hospital's new moms group following the birth of my son and hers. 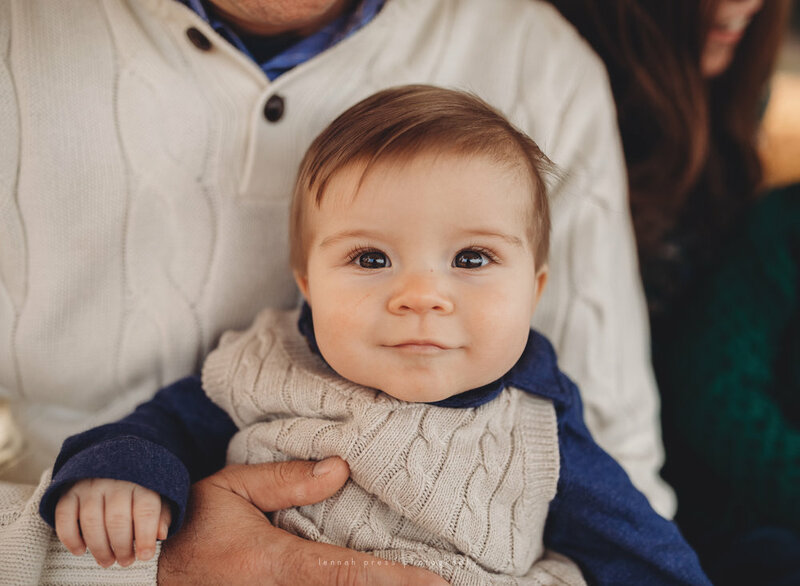 She has been a huge supporter of my work, and has booked sessions time and again, and it's such an honor to be able to photograph her adorable guys as they grow. William, her son who's the same age as mine, gives me an excellent workout during our shoots, as I find I spend a lot of time chasing him around. But I honestly love that, I get to capture real images of who William is, mischief and all. And get to my 10,000 step goal quicker too! It's not every day that you and yours get dressed up, load into the family car and head to a random location in exurban Virginia. I've compiled a list of things to expect when booking an outdoor session with Lennah Press Photo & Paper. I'm not alone in the photography world when I say that I love shooting during "golden hour" or the hour after sunrise/hour before sunset. The light at these times of day is soft, the temperature of the light is warm, and colors appear so rich and creamy. It's utterly magical, and I just can't get enough of it. There's a fleeting nature to this time of day, and the images captured within it feel like a enchanted memory to me. Golden hour isn't actually an hour, it depends on a number of factors including the date, time and location of the photographer in relation to the sun. Some days might only have that magical light for 5 minutes, some days it doesn't make an appearance at all due to cloud cover. 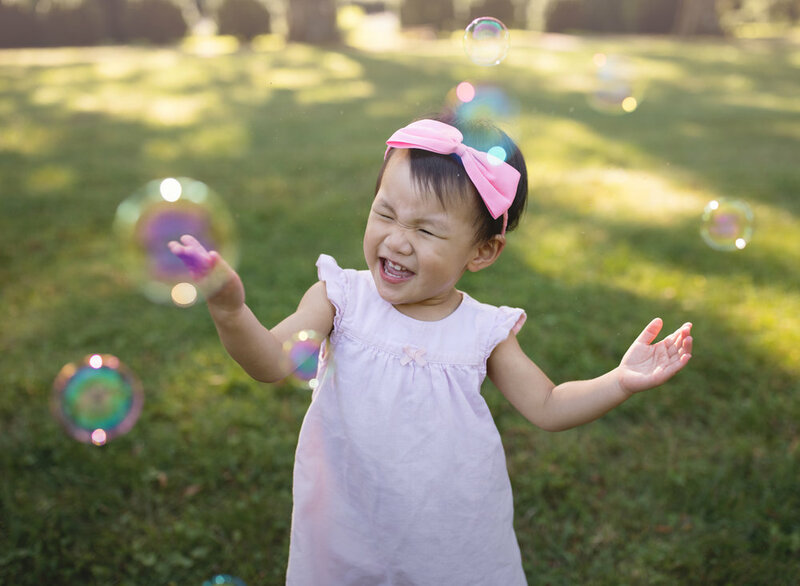 The timing of golden hour can pose problems when photographing babies, toddlers and young children who might usually be in bed during this time. I stand by the statement that I would rather have a happy child than a beautifully lit angry child. But if the sun-drenched images in my portfolio drew you to my work, I ask that you consider being flexible to scheduling your shoot during golden hour. As a mother of two myself, I understand how important routines are to a child's day. But if you think your child/children can handle it, and you can do things to mitigate meltdowns (such as pushing nap time back, bringing snacks, promising a very special treat following the session), my advice is to go for it. I've lived in Loudoun county for 6 years, and I am still taken aback by it's rural beauty. Some of my favorite spots for photographing families are rugged and rustic...i.e. you will probably have to drive a ways to get to the location, that route will most likely include a gravel road, we might have to pause the session to swat a few gnats, and I'll almost always advise to check for ticks afterwards. I prefer locations that aren't teeming with people so that your family can relax and be yourselves, and you are free from fear of your child/children running into danger. I call my brand of photography "life-inspired." I almost always try to get the "grandma shot" early in the session. You know what I'm talking about, the one where everyone is looking at the camera and smiling, the kind of image that a grandma would love! Once that's out of the way, we can all really relax and just have fun. You should know that I will be hands on, I will pose you, I will fix an errant hair, I will ask you or your spouse to stand SUPER close to me so that your 9 month old is looking at my lens and smiling, not off to the side. And in some cases I might seat you in a way that might feel really awkward and unnatural. But trust that I am posing you in a flattering way and making sure that everyone looks their best. On that note, please tell me if there are bad knees or other injuries I need to consider! Dads already don't care for family photo sessions, I'd hate for him to come out of it with a stiff hip or tweaked knee! If you have kiddos, we will play games, and let them be kids! I've found that this is the best way to get real smiles, and capture lasting memories of such a fleeting time. As they say, the days are long but the years are short. Someday you won't be able to scoop your child up in your arms and flip him upside down. Let's preserve memories like that. In many cases I will ask that you NOT look at me. It sounds like such a cliche photographer thing to say, but oftentimes my favorite images are those where it's like I wasn't even there. I want true interaction, emotional connections, and real feeling. Those are the moments I live to photograph. Life-inspired. In the same way that I veer towards rustic settings, I'm drawn to a vintage vibe when it comes to props. In most cases I'll bring a crocheted vintage afghan, vintage quilt and a neutral blanket for sitting poses. Then I will tailor props to the age of your kiddos. For a 10 month old, I might bring a vintage galvanized steel wash basin to plop her in, for a baby that can stand supported, I would bring a crate for him to lean on. You're more than welcome to bring props of your own, but try to keep them timeless. I also have a few tricks up my sleeve if we are really having trouble getting smiles out of little ones. Upon e-signing the contract, I will send you a little "what to wear" guide to help you in choosing your family's outfits. First and foremost, I want to photograph YOUR family, not the family you found on pinterest. So while I offer advice for those who would like it, most importantly, you do you. The reason I send the guide is that I've found that clothing has been one of the biggest concerns for clients, and part of my job is alleviating any stress you might feel about your session. You should probably know that when I'm trying to get smiles out of kids, I act really ridiculous. 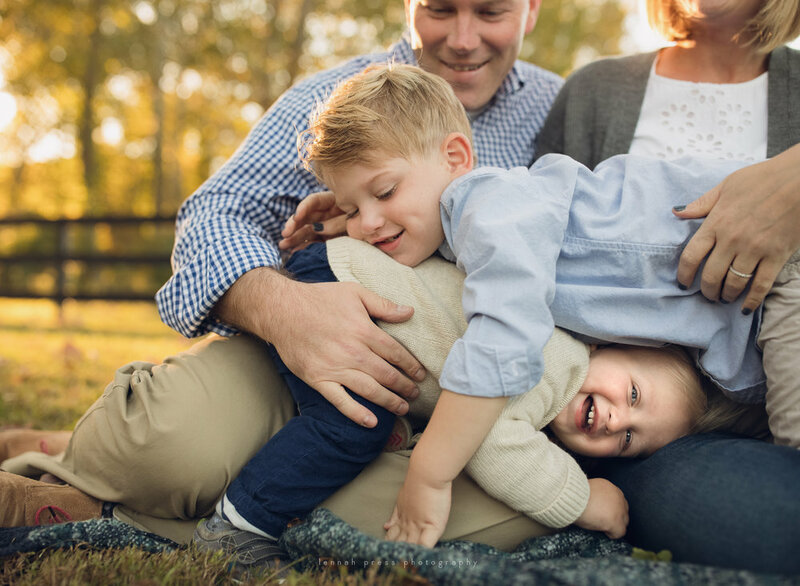 Maybe you're laughing at me, maybe you're laughing at how badly you want to be anywhere but sitting on a quilt in Loudoun getting family pictures taken. But I just love personality, especially when it comes through in a photograph. I will include silly pics in your gallery where your husband is photobombing, or your baby is giving her brother the stink eye. If it makes me laugh, I will include it.